The impermeable border the modern world sees existing between the world of the living and the afterlife was not visible to our ancestors. The dead could--and did--cross back and forth at will. The pagan mind had no fear of death, but some of the dead were definitely to be dreaded: those who failed to go peacefully into the afterlife but remained on this side in order to right a wrong that had befallen them personally or to ensure that the law promoted by the ancestors was being respected. But these dead individuals were a far cry from the amorphous ectoplasm that is featured in modern ghost stories. These earlier visitors from beyond the grave--known as revenants--slept, ate, and fought like men, even when, like Klaufi of the Svarfdaela Saga, they carried their heads in their arms. Revenants were part of the ancestor worship prevalent in the pagan world and still practiced in indigenous cultures such as the Fang and Kota of equatorial Africa, among others. The Church, eager to supplant this familial faith with its own, engineered the transformation of the corporeal revenant into the disembodied ghost of modern times, which could then be easily discounted as a figment of the imagination or the work of the devil. The sanctified grounds of the church cemetery replaced the burial mounds on the family farm, where the ancestors remained as an integral part of the living community. This exile to the formal graveyard, ironically enough, has contributed to the great loss of the sacred that characterizes the modern world. After analyzing the texts, it is possible for us to make a distinction between false and true revenants. The issue of true revenants--dead people who return of their own volition for their own reasons--will be examined in chapter 5. The false revenants that are the subject of this chapter, however, are the dead that make an immediate appearance after their decease, as if they continued to live for a span of time, or the dead who seem to have been called back to life under certain circumstances. Here, we will examine these two groups of false revenants: first, the dead who were carried to the grave against their will, then the departed who came back to life in self-defense, because their sepulchre has been violated, or because they have been forced to return through necromancy. Losing life certainly cannot be pleasant, but being buried in exile, removed from the community of the living, was, it seems, intolerable. This was the true death--exile in a timeless retirement. It is easy to deduce the considerations related to this death from the references that pepper the narrations here and there. Someone named Hrapp asks his wife to make sure that he is buried standing up beneath the kitchen door so that he can watch over the household. Karl Thorsteinsson has himself buried at the edge of a river so that he can watch the coming and going of the ships. Ingolf requests that his body not be placed in the family mound but by the side of the road so that the girls of Lake Valley would remember him. It is therefore not surprising to see such deaths followed by strange phenomena. Sigrid died during the night; a coffin was made in which to place her body, but things occurred that caused someone to be sent to fetch back her spouse. Then Thorstein Ericksson sent word to his namesake (Master Thorstein) to come to him, saying there was no peace at home because the farmer’s wife was trying to rise up and get into the bed with him. When Thorstein entered, she had reached the sideboards of the bed. He took hold of her and drove an ax into her breast. Thorstein Eriksson died near sundown. [ . . . ] It was not long until the sickness came to Thorstein’s house, and his wife, Grimhild, was the first to fall ill. She was a very large woman, with the strength of a man, yet she bowed to the illness. Soon after that, Thorstein Eriksson was stricken, and both of them lay ill until Grimhild, wife of Thorstein the Black, died. After she had died, Thorstein the Black left the room to seek a plank on which to put her body. Gudrid, the servant, then spoke, “Don’t be away long, dear Thorstein,” she said. He promised to do as she asked. Thorstein Eriksson then spoke, “Strange are the actions of the mistress of the house now; she’s struggling to raise herself up on her elbow, stretching her feet out from the bedboards and feeling for her shoes.” At this, Thorstein the Black returned, and Grimhild collapsed that same instant, with a cracking sound coming from every timber in the room. Thorstein then made a coffin for Grimhild’s body and took it away and secured it. He was a large, strong man, and needed to call upon all his strength before he managed to remove his wife from the farm. This final touch recurs frequently in the sagas: Sometimes even a pair of oxen can barely manage to pull the cart in which the deceased have been placed. Sometimes the body makes itself so heavy that it has to be buried wherever it seems to want to remain. In the following instance, Arnkel is bringing Thorolf Twist-Foot to his final resting place: “After a yoke of oxen had been hitched to sled, Arnkel laid Thorolf on it, and they began driving it through Thorsardale. It was hard work hauling Thorolf to his burial place.” This resistance does not presage anything good, and the narrator adds: “When they got him there, they built a solid cairn (rammliga) over him,” which clearly shows that everyone feared his return. The recalcitrant dead are not people that are easy to move and the coffin offers no resistance to their pressure. One night, Audun went in search of Thorgils. Gyda, his mother, had died in a bizarre fashion, causing the flight of the entire household. It should be said that she had witchlike powers. Audun wished to bury her and was looking for help. Thorgils and he went to the farm, built a coffin, and placed Gyda’s body inside. “Let’s carry the bier,” said Audun. “Put it in the ground and place over it the heaviest objects we can find.” Because two precautions are always better than one, they encircled the bier with iron bands before starting off. They had barely gotten any distance from the farm when the coffin groaned, the iron bands burst into shards, and Gyda emerged. Audun and Thorgils grabbed her, and to hold her, they were forced to use all their strength, and they were both hearty men. Incapable of carrying her any further, they burned her body. Claude Lecouteux is a former professor of medieval literature and civilization at the Sorbonne. He is the author of numerous books on medieval and pagan afterlife beliefs and magic, including The Book of Grimoires, Dictionary of Ancient Magic Words and Spells, and The Tradition of Household Spirits. He lives in Paris. "I've read all kinds of ghostly folklore type books. 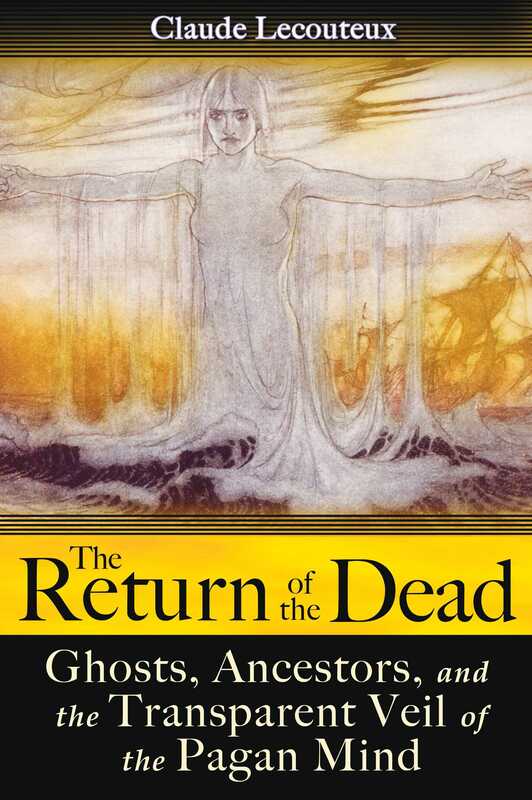 However, this book discusses revenants and ghosts from a whole new perspective, through the lens of medieval literature. . . . The Return of the Dead focuses, equally, on the steps the church took to eliminate Pagan beliefs and how the citizens adapted to the church's influence. I find the evolution of religions fascinating, making this my favorite thing about the book." "[Lecouteux's] conclusions . . . are stimulating and thought provoking. . . . I had no difficulty following his reasoning nor in accepting his conclusions. The book is well written, easily understood by even the average layman, and an invaluable addition to understanding the mindset of our European Pagan ancestors." " . . . [Lecouteux's] expertise lends to a powerful survey." " . . . a scholarly survey of pre-Christian beliefs, focusing in particular on legends of revenants in Germanic and Scandinavian folklore. . . . highly recommended to those interested in thanatology." "It is clear that many of the original pagan beliefs survive to the present day, as do the Christian beliefs. They tend to overlay each other not only in northern Europe, but also in every culture to which northern Europeans migrated. Many parts of this book will resonate for the reader of European descent. For readers from other backgrounds, it will be fascinating insight into why we have such beliefs in this area. I recommend this work to medieval scholars and students, those who wish to trace belief systems and present-day pagans who want real information on their beliefs." "The Return of the Dead will change your perceptions and show you an ancient body of tradition and belief than can still be found today within some of our modern practices. Even better, this work will show the reader how to approach death from a polytheistic Pagan perspective and reading The Return of the Dead just may change your funeral plans."